Addressing the rally, Shah said he felt fortunate that the BJP had nominated him from Gandhinagar constituency, a seat that has also been represented by former Prime Minister Atal Bihari Vajpayee and Purushottam Ganesh Mavalankar. With top leaders from the BJP and its allies sharing the stage, BJP president Amit Shah Saturday filed his nomination papers for the Lok Sabha election from Gandhinagar in Gujarat. Before that, Shah addressed a rally and conducted a roadshow in Gandhinagar in a show of strength to demonstrate that the NDA was strong and “united” against the Opposition alliance. Advani, who Shah replaced as the Gandhinagar candidate, was absent, however, both in person as well as in posters from the Vijay Sankalp rally, the four-km roadshow and when Shah filed his nomination papers. SHAH had a much bigger assembly than Modi did when he filed his nomination papers in 2014. 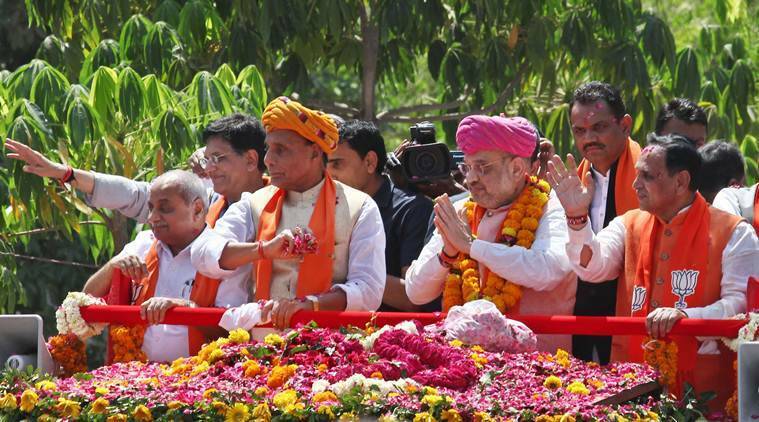 Top leaders of the BJP’s alliance partners Shiv Sena, Akali Dal and LJP, apart from two former party presidents, Rajnath Singh and Nitin Gadkari, accompanied Shah. While this clearly signalled Shah’s political weight in the BJP and the NDA, the absence of party patriarch L K Advani, whom Shah seeks to replace at the Gandhinagar seat, did not go unnoticed. Shah did briefly mention Advani saying he represented the Gandhinagar seat in Parliament for a long time while Union Home Minister Rajnath Singh called Advani a “kaddavar neta (heavyweight leader)” and said Shah was going to carry forward his (Advani’s) legacy. After the BJP denied him a ticket citing the party’s upper age restriction policy, Advani’s absence in all three Gandhinagar events did not go unnoticed. Advani represented Gandhinagar for six terms since 1991, barring 1996, when Vajpayee was elected. Shah’s programme in the city began with a rally in Sardar Patel Chowk in Naranpura with top leaders from NDA allies including the Shiv Sena, Akali Dal and Lok Janshakti Party (LJP). Shah even touched the feet of Akali Dal leader Parkash Singh Badal. In his address, Rajnath Singh said the Congress should be “punished” for using “abusive words” against the Prime Minister. “Put everything aside for a month and work to take the BJP and the NDA to the top,” he said. After drawing flak for denying tickets to party veterans including Advani and Murli Manohar Joshi, the BJP Saturday also ensured that former party presidents Rajnath Singh and Nitin Gadkari were on stage to signal Shah’s political significance in the BJP. When Shah filed his nomination papers, Rajnath Singh, Uddhav Thackeray, Union Finance Minister Arun Jaitley and Gujarat Chief Minister Vijay Rupani were present. And plasters across posters were Prime Minister Narendra Modi, Shiv Sena president Uddhav Thackeray, LJP chief Ram Vilas Paswan and Badal. The posters had the BJP’s election lotus symbol with the slogan “phir ek baar, Modi sarkaar”.